CANBERRA, Australia — Australia's prime minister on Tuesday raised the prospect of the nation suffering its first economic recession in 28 years if the opposition wins general elections due by late May. Prime Minister Scott Morrison outlined his conservative government's economic credentials in a speech in which he promised to detail in April Australia's first surplus annual budget in a decade. 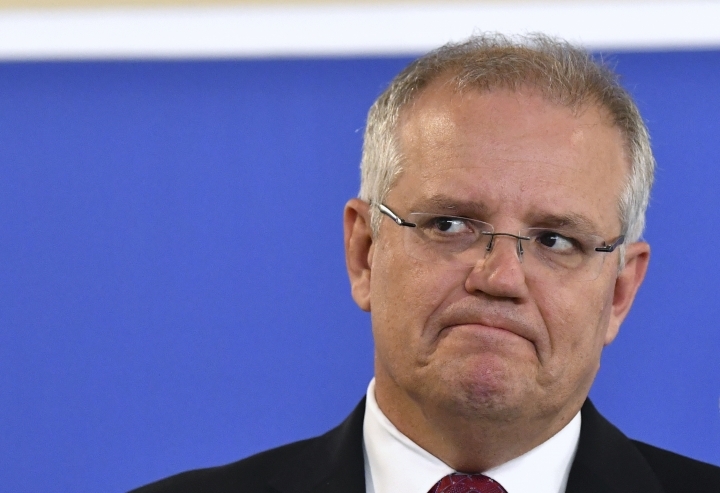 "Only half of those of voting age at this election will have ever experienced a recession during their working lives," Morrison said. "I don't want them to learn how important a strong economy is to each and every single one of them by having them endure the cruel lessons of a weaker economy that would occur under the Labor Party," he added. "They've run out of anything to say about themselves, all they can do is talk about us," Shorten told reporters. Australia had not experienced recession — defined at consecutive quarters of economic contraction — since July 1, 1991. Updated Treasury Department forecasts released last month showed Australia's economy is expected to expand by 2.75 percent in the current fiscal year ending June 30 and by 3 percent the following year. Deloitte Access Economics, an economic forecaster, predicted on Tuesday Australia's economy will be affected by slower global growth in the next two years. The forecaster also said Australia's growth would be weighed down by tightening credit, widespread drought and falling rates of housing construction. The government argues the center-left Labor Party opposition was a threat to the economy through its policy of reducing Australia's greenhouse gas emissions by 45 percent below 2005 levels by 2030. The government's target is a reduction of 26-to-28 percent in the same timeframe. The government also opposes Labor plans to reduce tax deductions for landlords as property prices moderate in Australia's largest cities. Morrison argues that Labor would raise 200 billion Australian dollars ($175 billion) with new and higher taxes that would weaken economic growth. The government has been trailing Labor in most opinion polls since in the last election in 2016. The ruling coalition lost its single-seat majority in the House of Representatives — where parties form governments — when former Prime Minister Malcolm Turnbull quit politics after colleagues ousted him as leader in August last year. The respected Newspoll published in The Australian newspaper on Tuesday showed 53 percent of respondents supported Labor and only 47 percent supported Morrison's coalition. The poll was based on a nationwide survey of 1,634 voters last weekend. It had a 2.5 percentage-point margin of error.